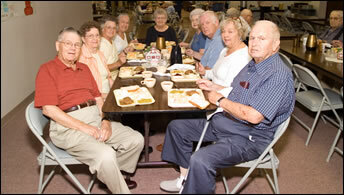 The Colfax County Senior Center (a/k/a The Center) is a combined meal site and focal point in Schuyler. The Center provides a place for health clinics, community events, school information, fellowship and many other activities. Noon meal is served Tuesday – Friday from 11:30 a.m. – 1:00 p.m. Suggested Contribution for eligible congregate meals is $4.25. Price for those under 60 and carryout is $7.75. An evening meal is served every Monday at 5:30 p.m. Available home delivered meals originate from The Center.